Two hundred housing units originally occupying this triangular site were demolished to make way for underground parking facilities and a local park. The two warden’s residences are combined with a shop and a pedestrian entrance. The houses constitute a respectful tribute to Dutch architecture in what had hitherto been regarded as an impossible marriage of Amsterdam School and Nieuwe Bouwen: brick, all but blankwalled facades, round forms and vertical accentuations in a harmonious interplay with rendering, large areas of glass, terraces and horizontal and rectangular forms. 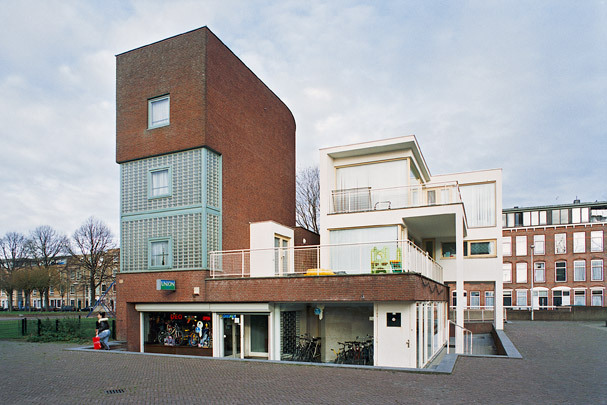 Siza also designed two housing projects in the Schilderswijk quarter, on Suze Robertsonstraat and Doedijnstraat.